Nagurski is the subject of two quite famous and equally dubious stories in Chicago Bears Lore. In the first, Minnesota Gophers head coach Clarence "Doc" Spears was in International Falls, MN, looking to scout a quarterback. Spears allegedly came across Nagurski, iron plow in hand, plowing a farm field. When Spears asked Nagurski where the quarterback lived, Nagurski picked up the plow (weighing hundreds of pounds) and pointed in that direction. Great story, but Jim Dent dismisses it Monster of the Midway, his book about the legend. The other story has Nagurski cracking the Wrigley Field wall with his head after a vicious hit. Regardless of truth to these legendary stories, Nagurski was a charter member of the Pro Football Hall of Fame even though he started playing a decade after the league's founding. 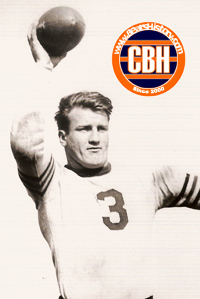 He played for the Bears from 1930-1937, retired, then was lured back into action in 1943, helping lead the Bears to another NFL championship that season. Died in 1990 at the age of 81.